Handcrafted British Organic Cheddar, this cheese has a rich flavour and a creamy texture with a slightly buttery taste. A brand new product for Lye Cross Farm, this Cheddar is handcrafted in the same manner as all of our cheese, using the traditional technique of ‘Cheddaring’. However, this Cheddar is different from the other cheeses that we produce on site. It has a creamy texture and slightly buttery taste, and this can be attributed to the milk used in the production process, which comes from cows that are certified 100% grass-fed. Free to roam on natural pasture land the cows’ diet consists entirely of grass and forage, free from any artificial fertilisers and pesticides. Well cared for, they require very little veterinary attention and lead peaceful, happy lives in natural environments and often in family groups. The cows are not treated with antibiotics and are rBST and rBGH free. 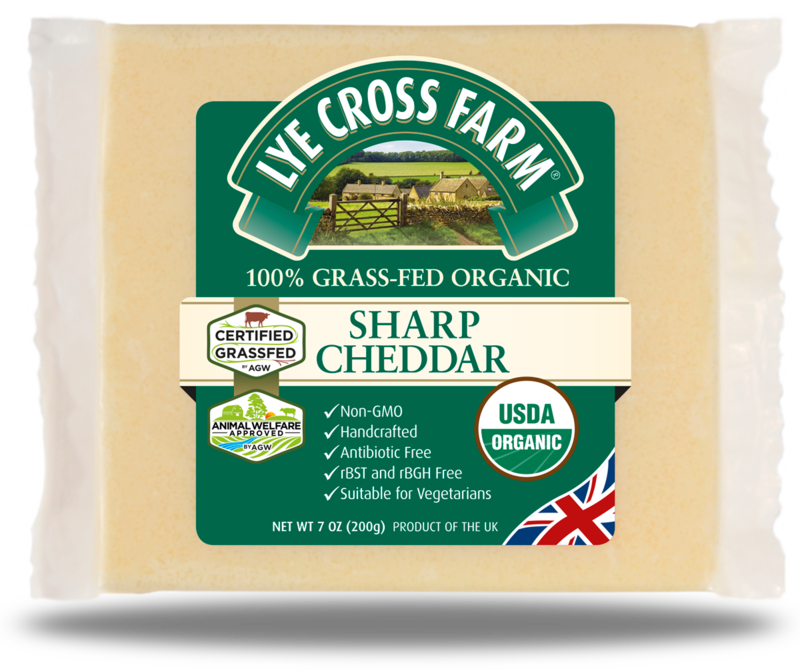 This cheese is certified as 100% grass-fed in both the United Kingdom and the United States, by The Pasture-Fed Livestock Association and A Greener World respectively, and is also certified Animal Welfare approved by A Greener World. The cheese is certified organic by Soil Association Certification.